Facebook is undeniably the world’s biggest social network, with over 2.07 billion users. The team behind Facebook has been active lately, rolling out new features for its users such as intelligent photo tagging, better groups, and much more. While the company has had some issues in the past, Mark Zuckerberg, the company’s CEO has promised a brighter future for the Facebook this year. Now, as part of this bright future, the company is also looking to expand its business, by diving into the home device market with its own video chat device. 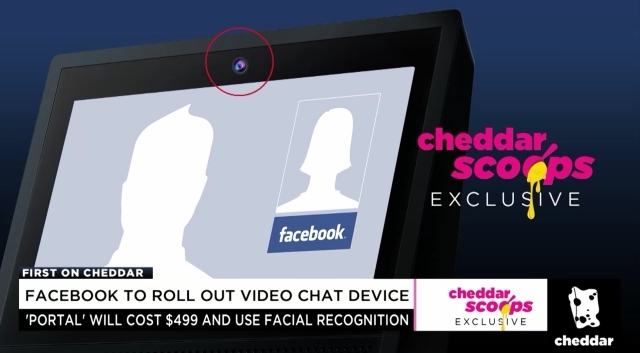 As reported by Cheddar, Facebook is reportedly working on its own video chat device, which is set to go head-to-head with Amazon’s Echo Show. Named “Portal“, the device is designed to work in the home and is said to be the first product in the line of the company’s serious foray into selling consumer hardware. Similar to Amazon and Google’s smart home devices, Portal can be activated by the use of voice commands. That being said, it will not feature an embedded AI or voice assistant. The main idea behind Portal is to create a dedicated smart home device that one can use for video calling their friends and family. The device will reportedly be equipped with a wide-angle lens that would use Facebook’s smart algorithms to accurately identify individual faces and associate them with their Facebook accounts. Furthermore, the company also intends to allow Portal to stream multimedia content via Spotify and Netflix. The device will reportedly be equipped with a wide-angle lens that would use Facebook’s smart algorithms to accurately identify individual faces and associate them with their Facebook accounts. Facebook is planning to officially unveil Portal at this year’s F8 conference in May, while the device is likely to start shipping in the second half of 2018. The expected price for Portal is said to be $499, with a price-cut subject to user adoption.